While most of the hockey world has now turned its attention to free agency, we’re moving toward next week’s Development Camp in Los Angeles. As is the annual summer tradition, nearly all of the Kings top prospects will be descending upon Los Angeles this weekend, with on-ice activity set to open on Monday at the team’s training facility in El Segundo. While the official roster has yet to be released, below is the list of names expected to attend. From what we have been able to gather, all of the Kings 2015 draft picks are expected to attend, with some last minute issues being worked out with Alexander Dergachyov (selected in the third round out of Russia). In years past, most prospects aged out of Development Camp after around three years pro, so the status of some ‘older’ prospects may be in question. Goaltender J.F. Berube is definitely not attending, while somebody like Nic Dowd (who only turned pro a few months ago), could still be among the participants. Meanwhile, we wouldn’t expect Andy Andreoff or Jordan Weal to attend this year, but we’ll see. NOTES: Lowry is still recovering from back surgery and has yet to sign his pro contract. He may or may not attend the off-ice activities, as other injured players have in the past. Most years, Dev Camp also features a small handful of non-drafted invitees. Thus far, only one name has come up (see below), yet we would normally expect a few more to attend – especially on defense. Several other players, like Paul LaDue, will be in Los Angeles for training in July, but are not expected to be part of next week’s official activities. Update on #LAKings 2015 draft picks – Erik Cernak taken by Erie (OHL) and Alexander Dergachyov by Shawinigan (QMJHL) in CHL import draft. News of camp invitees are still rolling in through twitter. 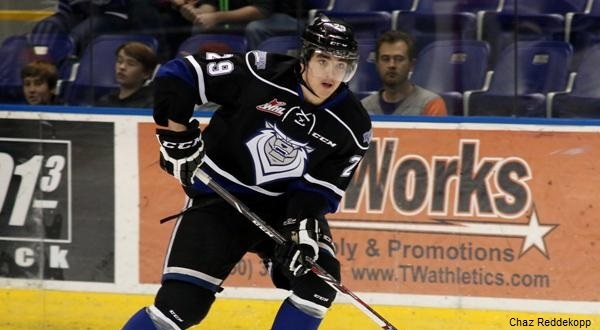 To see our most recent rankings of the Kings’ Top-10 Prospects, click here. This camp will serve as part of the evaluation process for the next edition of the rankings, which should publish right before Rookie Camp opens in September. As for the schedule, there are usually separate groups for the forwards, defensemen and goalies running from about 8:00-11:30am daily. Then, a full session with all prospects typically follows later in the afternoon, around 3:00pm. Expect the official schedule to be released shortly.